BOULDER, Colo. (USA Rugby Release) – USA Rugby has selected the 2014-15 Men’s Collegiate All-American and Honorable Mention All-American teams for the 15s and sevens codes of the game, honoring deserving college rugby players from more than 40 institutions. The players were based on the past seasons' performance and most importantly on their showing at the USAR (Men's) Collegiate All-American camp that was held from July 14-19, 2015 at California Maritime Academy in Vallejo, CA. 8 NSCRO players received Honorable All-American (15s) selection. From the above group, Matthew Moore, Eli Phillips, Ian Luciano, James Tayson, Lucian York and Kevon Williams were selected along with Ryan Morris and Austin Morris (both from Cal Maritime Academy). 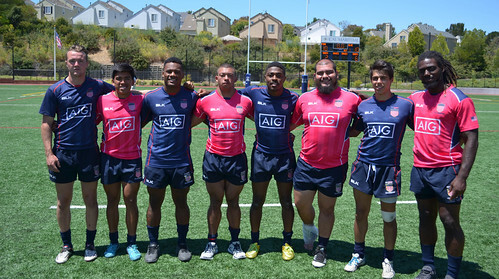 In addition, Jeremy Misailegalu and Kevon Williams received Honorable All-American Sevens selection. NSCRO is proud of these young men whose hard work and dedication has reaped a well-deserved recognition. The camp was the first opportunity for the new AIG Men's Collegiate All-American Staff to work in a national team assembly environment. Players from this camp will be selected to play with the AIG Men's Collegiate All-American Sevens team at Serevi RugbyTown Sevens in August, others will train with Taranaki Rugby in New Zealand, and overall standouts will be shortlisted for selection to MCAA and MJAA teams. The camp ran alongside the Men's Eagles' World Rugby Pacific Nations Cup assembly. According to Stephen Cohen, president of NSCRO, "There are a lot of great players out there that don't often have the opportunity to be discovered outside of their own club or union. We are proud to be able to give them the chance to, not only raise their caliber of play through our national playoff system, but also provide the national and international team scouts and coaching staff the opportunity and venues to evaluate these players." "We are thrilled to have eight of our NSCRO players be recognized for their talents and to be invited to participate in this camp. It's a testament to what we're trying to achieve as an organization and as a rugby community," said Cohen. After months of preparation, qualifiers and playoffs, four teams arrived at Infinity Park in Glendale, CO for their shot at the NSCRO Men's National Champions Cup title on 25-26 April 2015. The first of two semi-final matches featured two-time defending champion, St. John's University against Mount St. Mary's University while New England College faced California Maritime Academy in the second semi-final match on Saturday. The Johnnies came out in full force at the beginning of the match with a try by Sam Olmscheid which was converted by Tanner Hersch for an early score of 7-0 against The Mount. The Mount seemed to have woken up after than and came back firing to put 5 points by Zack Hirschler on the score board. SJU answered back with a quick goal, bringing their score to 14-5. Undeterred, The Mount attacked with a lineout then a seven meter scrum to bring the score to 14-12. The attack-and-counterattack continued right through the first half with MSMU taking the lead: 26-21. The second half saw much of the same action, again, with The Johnnies coming out the gate and closing the gap 28-26 at the 43-minute mark then further extending their lead to 33-26 minutes later. MSMU stormed back and put another 12 points on the board to take the lead, 38-33. After 80 minutes of intense play between these two teams, The Mount advanced to the final match with a score of 55-45. In the second semifinal, New England College faced off against California Maritime Academy. The NEC Lions came to Infinity Park on a mission to win the National title after losing in the final last year to St. John's. The Keelhaulers who, in 2012, were likewise 2nd place finishers and had plans of their own. Both teams came to play with the opening kickoff. NEC's fullback Cathal Finneran slotted a penalty kick at the 5th minute to put the Lions up 3-0. But it was Lions' winger Bryant Etuka that got the crowd going with a scintillating long run for a try at the 17th minute. Ten minutes later, Lions' flyhalf James Tayson took a lineout ball through a gap in the defense from 25m out to score by the posts. Finneran's conversion made it 15-3 which remained so through halftime. CMA's offensive sprung to life in the second half and both sides traded tries. When the final whistle was blown by referee Leah Berard, NEC had held on for a 25-18 win sending them back to Sunday's Championship final. The third place match began much like the semi-finals with St. John's coming out the gate with a try by 8-man Steven Oczak followed by a touchdown by Casey Walsh and a conversion by Tanner Hersch: SJU 12, CMA 0. The Johnnies continued their attack on the Keelhaulers, widening their lead to 19 points, but not until CMA managed to put 5 on the board before the whistle was blown. The Johnnies came out swinging in the second half with another goal by Benny Bissonette and then sealing their third place finish with a final goal by Hersch, ending the game at 38-5. The wet and chilly weather didn't dampened the spirits of the New England College Lions or Mount St. Mary's University in this championship match. NEC opened the match with a goal by Ky Young and a conversion by Cathal Finneran. A penalty goal by Tito Miranda put The Mount on the scoreboard: 7-3. The Lions answered back with another try by Daryl Wilson followed by a completion by Finneran and then a penalty goal by Finneran for a total of 17-3. The Mount took advantage of a yellow card against NEC with Tito Miranda putting seven points on the board before the end of the first half. The steady rain made playing conditions in the second half sloppy but NEC managed to make the most of it. The Lions came onto the field and quickly took possession of the ball, putting 10 points on the board 15 minutes into the second half. The Mount answered back with 8-man CJ Beasley crossing the goal for a score of 27-15. Unfortunately for MSMU, that would be their last opportunity to put points on the board. NEC closed out the match with one final goal, sealing their title as the 2014-15 NSCRO Champions Cup winner with a score of 32-15. For a full summary of each of the matches, visit www.thisiscoloradorugby.com. The roads taken by 215 men's colleges have reached their end in the NSCRO 15s National playoffs. A great season comes to the end...an even better one awaits starting in the Fall. Lions and Tigers rule the NSCRO jungle! The Lions of New England College and the Tigers of the University of the Pacific. Read below to see how it all came together. Rochester turned out to be no match for the powerful NEC Lions who won 72-5. ECSU then faced Oneonta likewise were dominant winning 65-5 in second semifinal at the Nov. 22-23 NSCRO Northeast Region Championship hosted by NEC in Henniker, NH. On Sunday, Rochester came back strong to beat Oneonta 50-7, while NEC had its toughest match in a long while prevailing over ECSU 38-12. NEC now returns to Nationals for the 3rd time in a row in just their 4 year of reformation in 2010. Neumann University was soundly defeated by the University of Mary Washington (Cardinals CRC Champ) 86-21 in the Mid-Atlantic Qualifier on Nov. 23. The South Cup was held on March 14-15 in Ocala, Florida. * UMW had to withdraw and was replaced by Cardinals Conference Runnerup Duke University. Mount St. Mary's returns to Nationals for 2nd year in a row. A testimony to the rugby program they have created. Neither snow nor can frigid temperatures keep a good rugger off the pitch. This was proven this past weekend in Elkhart, Indiana at the Moose Rugby Grounds. Thanks to Bart Bottorff and his staff at the MRG for transforming the snow-covered grounds into a very playable field. On Saturday, Three Rivers Champ Robert Morris University continued its surprising ways beating a solid University of Southern Indiana team 30-15. Defending National Champion, St. John’s University handled Great Lakes Champ Baldwin-Wallace University 48-25. On Sunday, USI came back at the end to edge Baldwin-Wallace 34-29 to capture 3rd place. Meanwhile, St. John’s took care of business with RMU dominating 77 to 10 and have punched their return ticket to Glendale next April for the National Championship at Infinity Park. This will be their third trip in a row and stands as a testimony to a well-run program. Now that NEC has done the same in Region 1 qualifying for their third straight appearance in Glendale...will there be a possible rematch with the Johnnies in the final? Time will tell. If additional event information is needed, please contact Scott Bracken at scott.bracken1@sbcglobal.net. Cal Maritime returns to Nationals for first time since 2012 where they placed 2nd to Salve Regina. Way to go Keelhaulers! Fans - to purchase tickets click here. If additional event information is needed, please contact Steve Cohen at president@nscro.org. Fans and Teams - Refer to Rules & Regulations for Infinity Park below.